In December, the Senate introduced legislation called the Kittens in Traumatic Testing Ends Now (KITTEN) Act, the companion to a bipartisan House bill of the same name targeting outdated food safety experiments at the U.S. Department of Agriculture (USDA). As Sen. Jeff Merkley (D-Oregon) explained to CNN when he introduced the bill, “The USDA breeds up to 100 kittens a year, feeds them parasite-infected meat in order to have the parasite’s eggs harvested for use in other experiments, and then kills the kittens. This bill would essentially stop this process.” To date, the project has consumed $22 million tax dollars and taken the lives of 3,000 kittens. Sadly, this extreme “research project” was not an anomaly. MARC uses more than $22 million taxpayer dollars and 35,000 animals annually, focusing on science and technology to make red meat production more efficient and profitable. In addition, MARC performs heavily taxpayer-subsidized targeted research on behalf of livestock commodity groups. USDA in-house agricultural research receives a total of $1.2 billion annually from taxpayers, and MARC is just one of 36 total USDA livestock animal research facilities. Precise figures for USDA animal research investments and attendant waste are impossible to ascertain, in part because the government obfuscates financial and animal use data. According to the USDA’s website, “[MARC] research will be used to develop technologies that can be implemented into production programs which will reduce production costs and improve carcass merit.” In lay terms, their quest is to boost livestock industry profits. In the process, MARC researchers undertake all manner of senseless experiments, and scientific and fiduciary malpractice that cost animals and taxpayers dearly. For instance, cows usually have one offspring. In nature, less than 2 percent have twins. MARC scientists decided to try and double production efficiency by increasing twinning frequency. From 1981 until 2011, MARC raised one herd’s twinning rate to over 50 percent using intense genetic selection. However, twinning in cows is unnatural; evolution so decided over millions of years. Twinning cows and their offspring suffered from sickness, congenital defects and early death. After 30 years and countless tax dollars, MARC abandoned the project. There is no market for twinning cows. In fact, most farmers cull cows birthing twins due to the well-known associated health problems. I supported intensive livestock farming and research for decades. However, I gradually turned against factory farming, in part from the alternative example of sustainable, environment- and animal-respectful practices I observed on my daughter Hannah’s small organic farm. So after decades of witnessing and facilitating MARC’s indefensible projects, in 2014, I went to The New York Times to share evidence of these abuses. One experiment I reported was the so-called “Easy Care” sheep project designed to resurrect the dying US sheep industry. The goal was to create a new sheep breed requiring minimal human labor via brutal neo-Darwinian selection. From 2002 to 2017, countless sheep birthing twins or triplets were kept year-round on isolated pastures without shelter or shade. Shepherds were prohibited, by experimental protocol, from intervening to care for ewes or lambs in need. Predictably, human-dependent domestic sheep treated like wild sheep fared poorly. Over 15 years, countless lambs died from coyote predation, starvation, exposure, abandonment, difficult birth and disease. The research failed completely, squandering untold tax dollars. For going public with my concerns, I was surveilled by law enforcement and interviewed by the Federal Bureau of Investigation (FBI) as a possible “eco-terrorist.” I was banished from MARC, “interviewed” by University of Nebraska (a MARC partner) police, called “the most evil person on the planet” by the MARC director, and eventually transferred 100 miles away. Whistleblowing placed an enormous strain on my personal and professional life. I incurred large legal and medical expenses. My career suffered, but survived. Sadly, my 32-year-long marriage did not. I knew the risks and I am responsible for my actions and their consequences. However, as an American taxpayer, veterinarian sworn to protect animals, and federal employee who was a steward of public dollars, I felt obliged to expose this government waste and abuse. For its part, the USDA essentially received a few slaps on the wrist, and evidence uncovered last year shows that major animal welfare problems persist at MARC and other agency facilities. In addition to the kitten testing mentioned above, inspection reports from several USDA facilities showthat in 2017, more than a dozen ducks died of dehydration, 38 turkeys died of starvation, and dozens of quails were found dead in a lab with a temperature of 130 degrees Fahrenheit when a heating system failed and there was no warning system in place to alert staff of the temperature change. I believe most Americans and even livestock producers would be hard-pressed to support some experiments the USDA is doing or has done on their behalf and with their money. 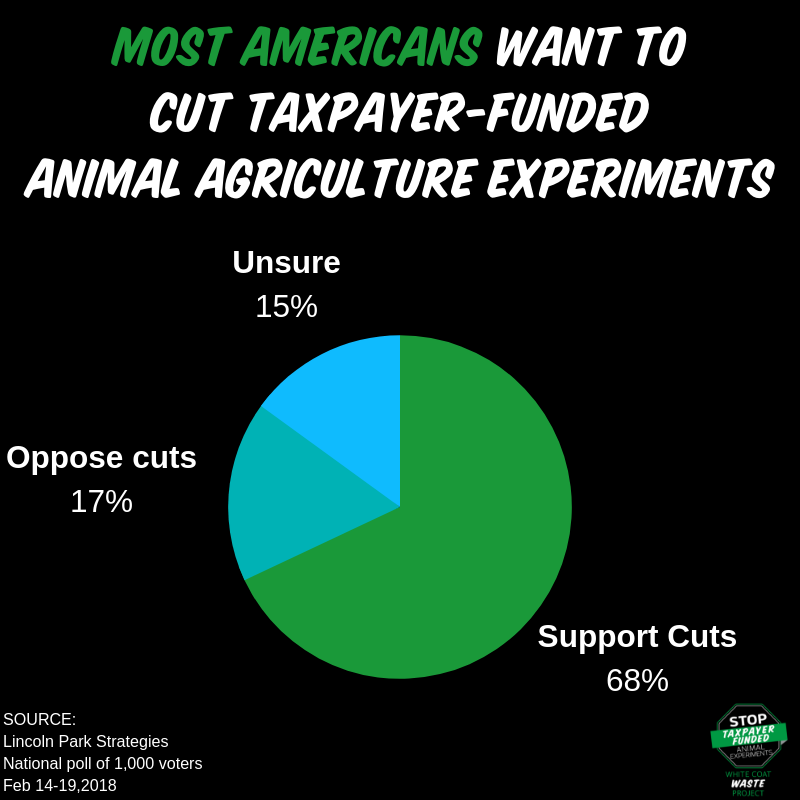 A 2018 national poll of 1,000 Americans commissioned by the taxpayer watchdog White Coat Waste Project found 68 percent of voters want to reduce taxpayer-funded research intended to benefit agribusiness. I put my career and family on the line to expose USDA waste and abuse. Congress must now act to protect animal welfare and prevent further misuse of American tax dollars on cruel and unnecessary research. Supporting the bipartisan, common sense KITTEN Act to get cats out of the USDA’s horrific labs is a great start. Jim Keen, DVM, is a veterinarian with 25 years of research and field experience in livestock health and production medicine, veterinary public health, zoonotic infections, and biomedicine. He is a faculty member in the University of Nebraska-Lincoln’s School of Veterinary Medicine and Biomedical Sciences.